Joining one of the UK's cycling clubs is a good way to interact with other mountain bike riders. For beginners, it is also a great way to start your involvement in the sport. This article offers advice on getting involved in cycling clubs. Why Join a Mountain Bike Club? While mountain biking is often an individual sport, there will be times when you want to seek out fellow mountain bike riders. This may be to swap tips or find like-minded people. Some people have made lifelong friends from joining a mountain biking group/club, and have gone on mountain biking holidays together. Joining a mountain bike club/group is one of the best ways for beginners to get involved in the sport. Clubs tend to cater for all ranges of abilities, so novice cyclists will be welcome. It is a good opportunity to learn from more experienced cyclists. Mountain bike clubs organise cycling events, and may also organise social events so that members can get to know each other away from the trails. Joining a mountain biking club often gives its members an added incentive to keep up their training and riding when they might otherwise let it fall by the wayside, as it maintains a competitive edge. 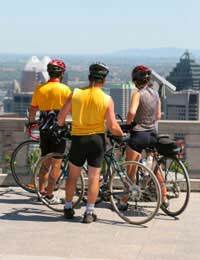 You can use the Internet to find a cycling club in your area. The British Cycling website has a list of cycling clubs in the UK, along with contact details. Many local cycling clubs have an Internet presence, so it's worth trying a Google search to see if you can find a cycling club in your area. Not all of these cycling clubs will contain mountain bike enthusiasts though, so you might want to involve yourself in a specialist mountain biking club for this. The British Cycling website also has a list of these, as does the MTB Britain website. These lists are not exhaustive though, and there may well be clubs and groups that are not included on either list. To become a member of a mountain biking club/group, you may be required to pay an annual membership fee. This is usually a fairly modest amount, and most riders feel that it is fully justified by the benefits. The CTC is the National Cyclists' Organisation in the UK. As well as the national cycling body, there are local CTC groups across the UK. Becoming a member entitles you to several member discounts, including discount at Cotswold Outdoor (for outdoor clothing), European Bicycle Express (for transporting bikes over to the Continent via their trailer service), CS Healthcare, YHA (for staying in their family-friendly hostels during self-organised mountain biking holidays and for their mountain biking breaks) and Cycling TV (for discounted television coverage of cycling on premium television channel Cycling TV). The cost of joining is considerably more than it costs to join the average local mountain biking group, but there a host of benefits, including CTC third party insurance when you take part in most CTC-organised cycling events. They also organise mountain biking conferences and cycling holidays.